Upper Woodward Avenue, including the area now devoted to Detroit’s Cultural Center, was emerging as an elegant residential neighborhood when this apartment building was completed in 1896. Most of the prestigious homes constructed in this area around 1900 were razed for the Cultural Center and Wayne State, but a few survive to tell us what was stylish at that time, including the Samuel L. Smith Home at 5035 Woodward, the Colonel Hecker mansion at the corner of Woodward and East Ferry and the Herman Strasburg Residence on Wayne’s campus across Cass from the Detroit Public Library. Louis Sullivan was among the innovative architects who contributed to developing the Chicago School of Architecture late in the Nineteenth Century. Some elements of that style were incorporated when William Malcomson and William Higginbotham designed the building you see. However, you will see other styles in this structure, including Romanesque. The tall or monumental component includes five stories and is flanked by symmetrical three-story wings. The base is smooth cut stone. The next layer was originally orange brick with a frieze. When constructed, it was designed to include 16 luxury suites. Beginning in the 1930s, federal housing policies made it easier for families to purchase homes, so the popularity of living in luxury apartments declined. 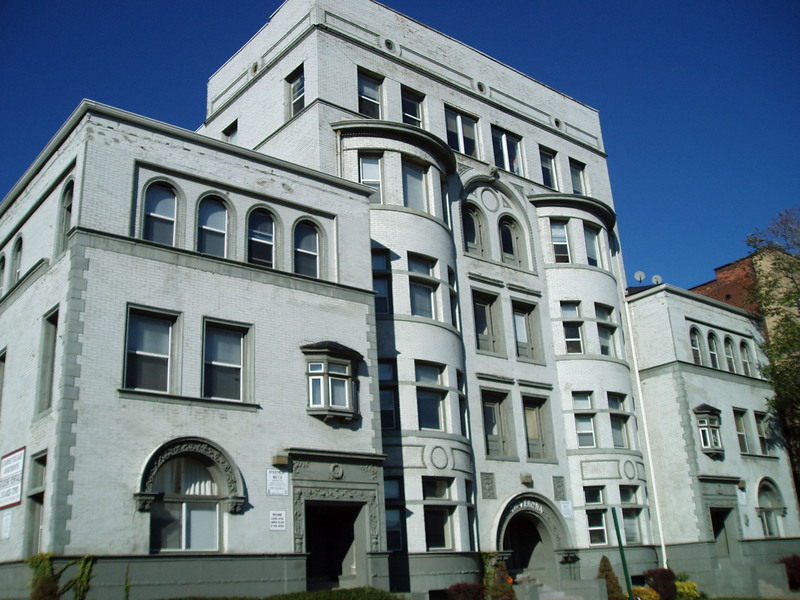 This building was reconfigured in about 1945 to accommodate 26 less spacious apartments. At some point, I infer that this building was painted in industrial gray. Perhaps it was more attractive eleven decades ago. Notice the unique entryway. It is quite unlike those of all other apartments’ buildings that I have entered. The arch at the entryway with its proclamation of the building’s name resembles in curvature the arch at the fourth level. You find interesting decorative touches throughout the exterior of this building. Compared to cities along the Atlantic seacoast with their much higher population densities, Detroit has relatively few apartment buildings. However, a variety of creative architects experimented with many different styles when they designed apartment buildings for Motor City’s prosperous families.